The completed kitchen viewed from the morning room. The layout was nto significantly change but the functionality was greatly improved. 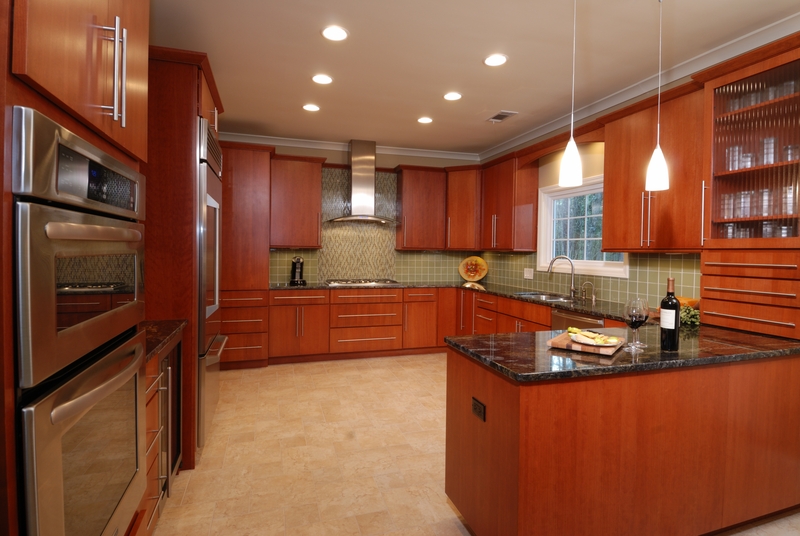 The style of the house had a contemporary feel to it and the homeowner selected the plain panel cherry cabinet doors. Not all contemporary styles have to have a cold feel to them. 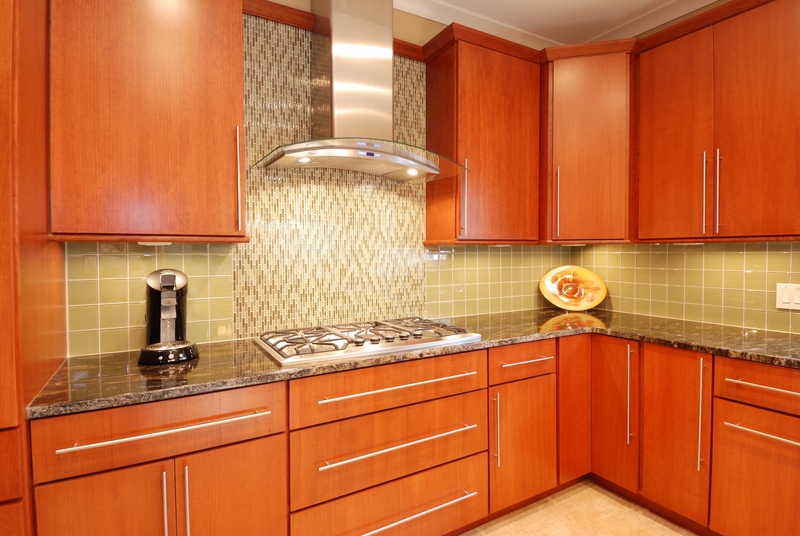 Clean lines and warm tones can work together to create an inviting feel. Sometimes we’re asked of the appliances have to all be from the same manufacturer. It’s not necessary. 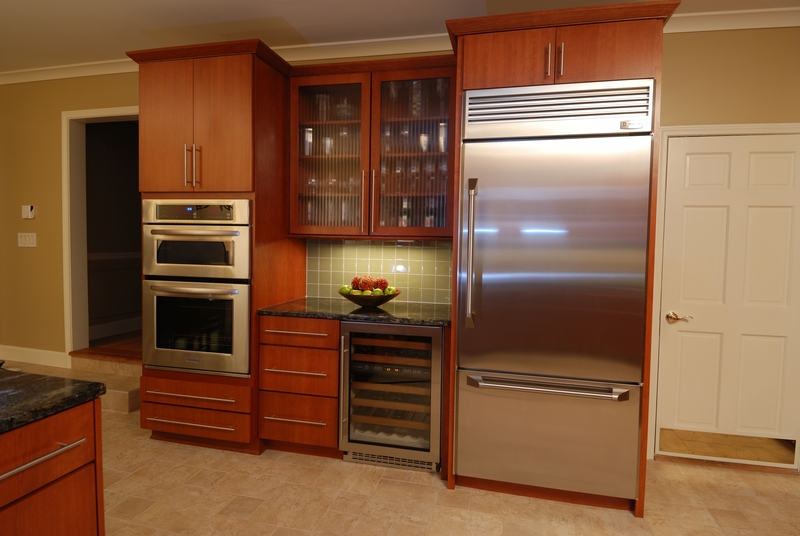 In the kitchen there were four different manufacturers and in this picture there is a GE Monogram refrigerator, a Sub Zero wine cooler, and a KitchenAid oven microwave combination. 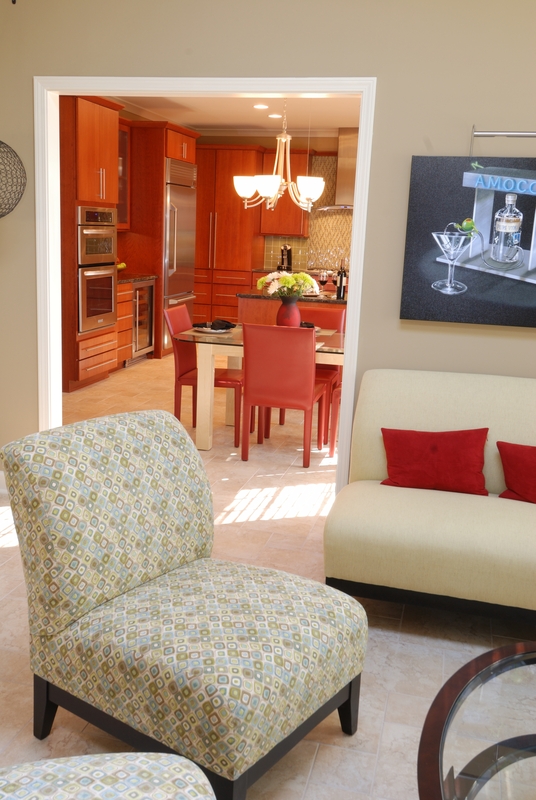 The peninsula creates a natural buffet between the kitchen area and the morning room. 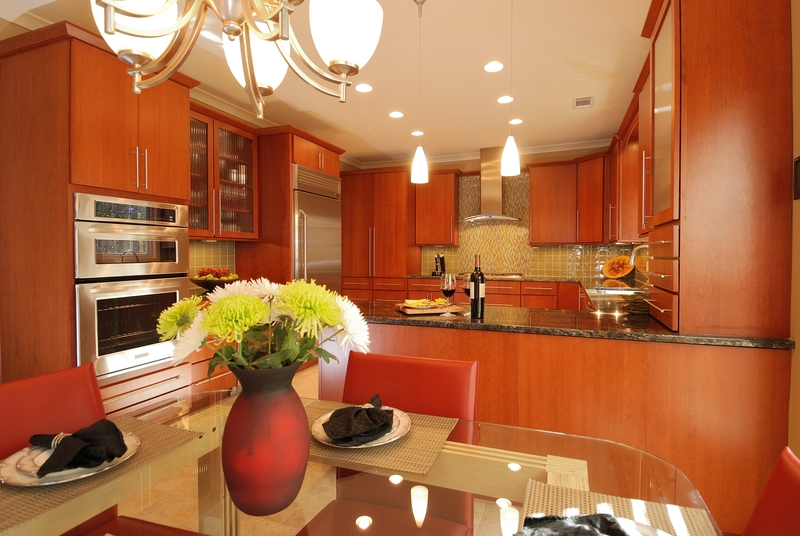 There is plenty of space to set serving dishes when the homeowner entertains and their electronic devices can be recharged inside the cabinet at the right instead of having them on the counter top. A view from the chef’s area of the kitchen. 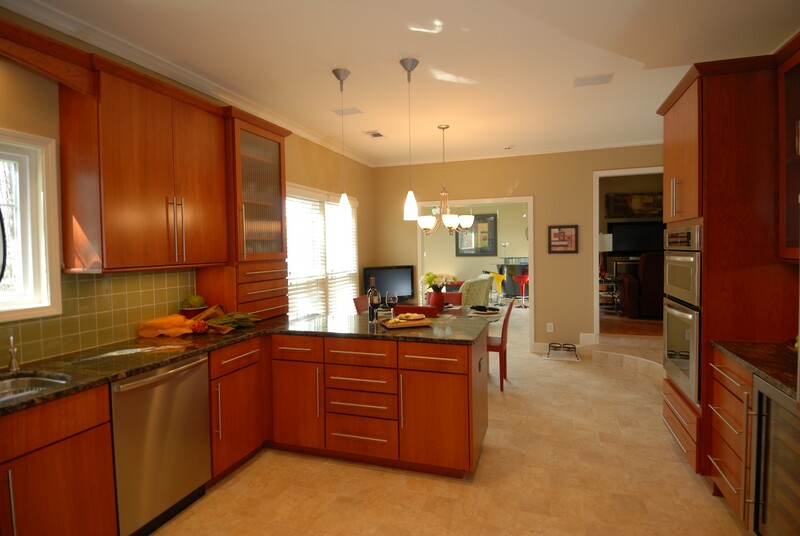 The space flows from the kitchen to the morning room to the Florida room at the far end. Looking back at the kitchen from the Florida room. 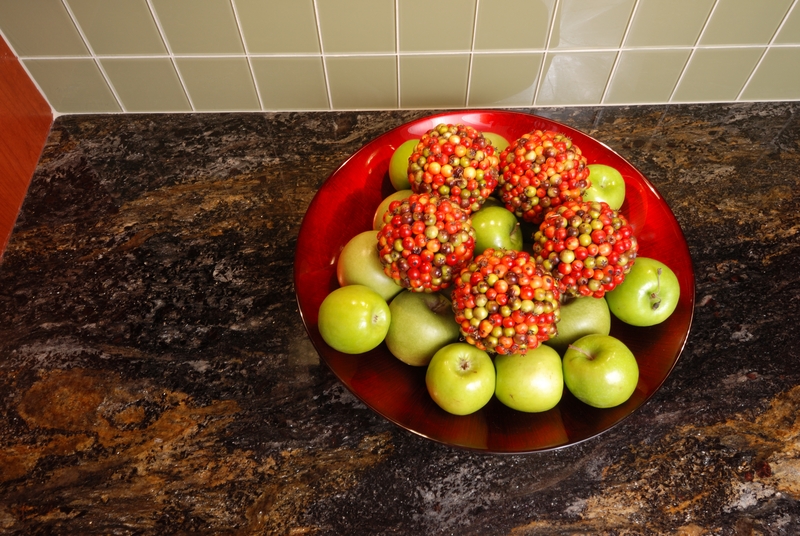 The spaces are tied together with color, using both warm and cool tones to complete the look. The cabinet under the cook top has drawers for pots and pans keeping them close a hand. 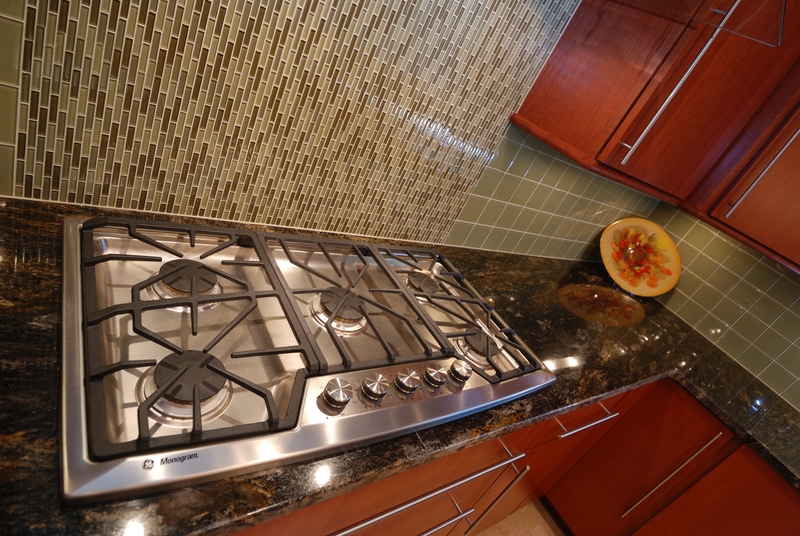 Instead of the more common professional cook top with the controls mounted on the front of the unit, the owner opted for a drop in cook top. It has plenty of power for cooking and cleaner lines. 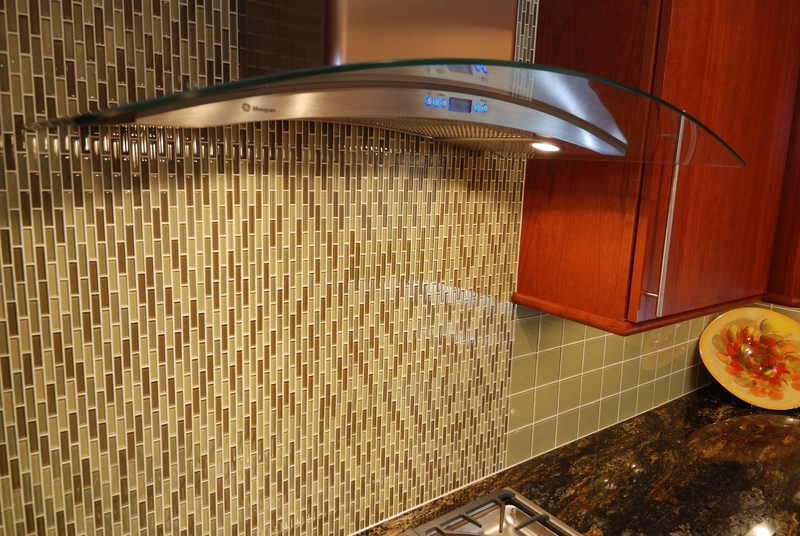 To minimize the visual impact of the ventilation hood, we choose a sleek with glass. Note the lighting from the hood provides plenty of light on the cook top. 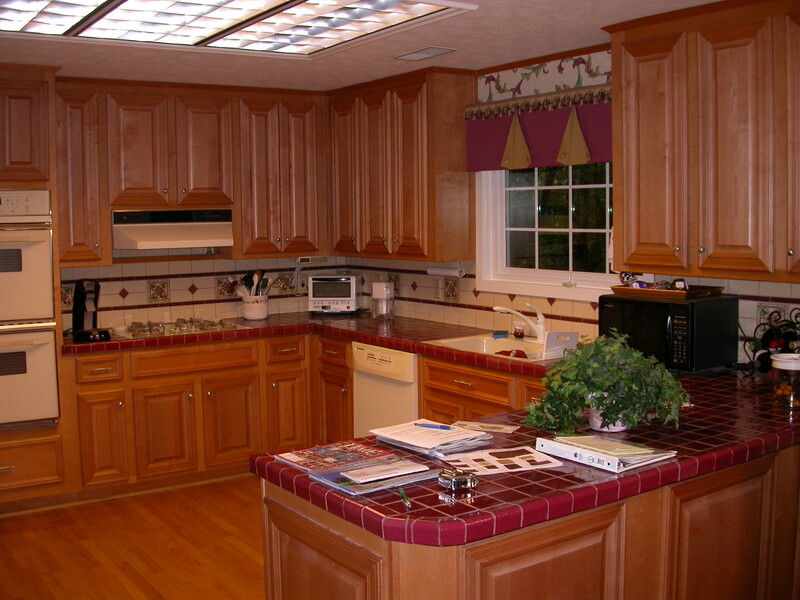 The counter tops are an interesting combination of tan, brown, black, and gray. 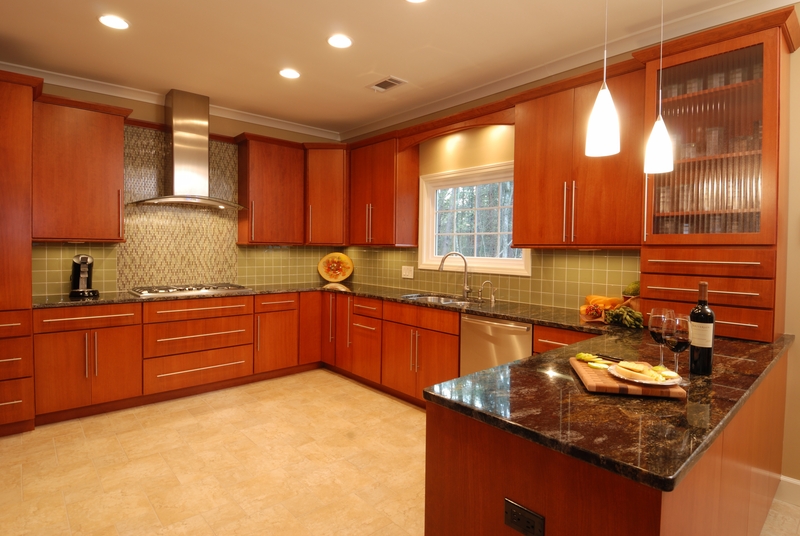 Careful consideration was given to the flow in the stone to make sure the finished counter tops looked great. The original kitchen had coral tile counter tops and the ceiling had been dropped down approximately a foot above the main cooking area. 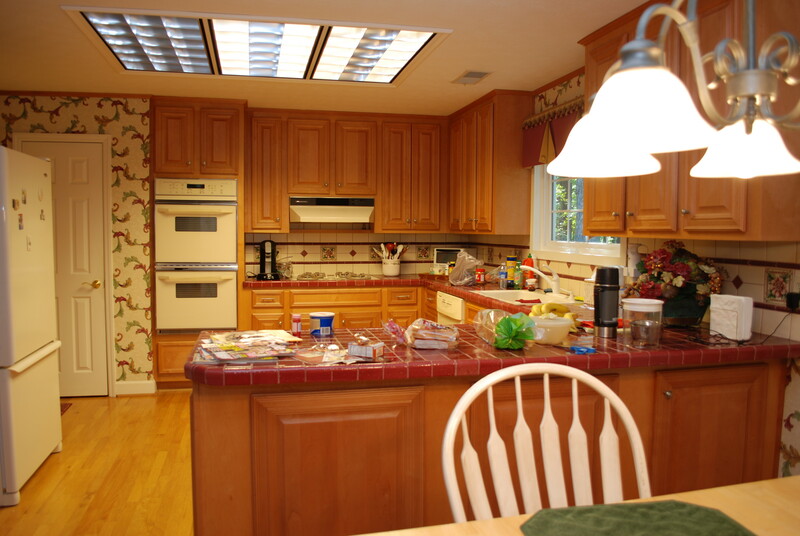 A view of the kitchen before the renovation. 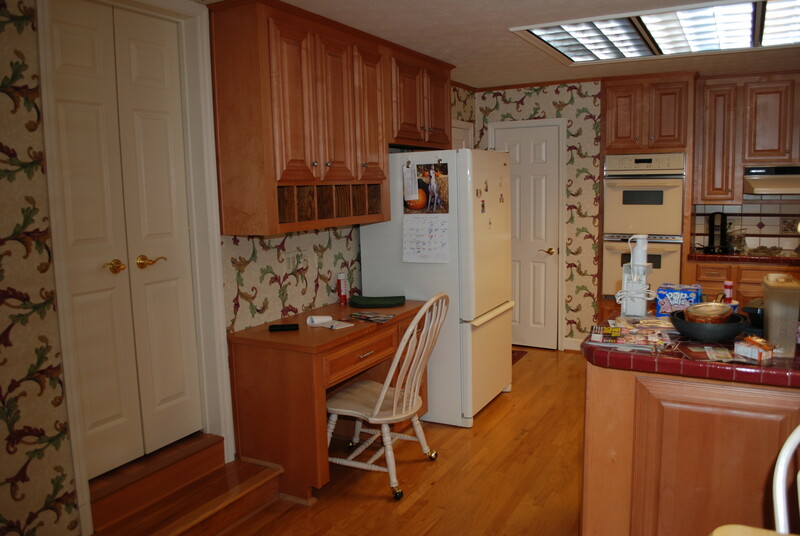 It has typical features from the 1980’s including the desk area in the kitchen. Another look at the original kitchen.